I’m so excited that the Productivity Bundle will be available through March 1, 2020! Why? First, so many productivity products are geared toward folks in the traditional work force or in specific fields (teaching, for instance). 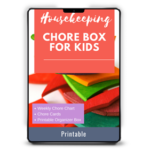 This bundle has resources for moms in all walks. And since my blog is “Productive Mama” you can probably get that mama-centered productivity tools tend to appeal to my audience! Second, this bundle includes a product I already promote on my blog on a regular basis. So you can get it AND a ton more in this bundle!! Which one? I am a big fan of this course and it runs for $47. But the ENTIRE BUNDLE costs $49.97!!!! This course makes this bundle worth it right there! Finally, I found this half hour video class to be a great resource. 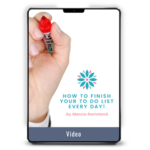 If you feel like you are starting from a place of total chaos, especially, How to Finish Your To Do List Every Day! by Marcia Ramsland has some fantastic, non-overwhelming advice. Additionally, I found it completely compatible with my FAVORITE planner, the Planner Pad. And it’s only a half hour long. The Ultimate Productivity Bundle was created and curated by people with real life responsibilities just like you: they have families, work part- to full-time jobs or run businesses, don’t have personal assistants or the budget for hiring lots of extra help. They want to help you (and themselves) conquer your to-do list, free up more time for yourself, and reach your goals.